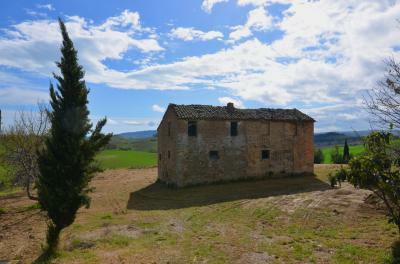 In the Marche countryside, close to the Town of Ripatransone, property in good conditions of about165 sqm with 2000 sqm of garden. The property is located in a really lovely and quiet location, where you can admire an unbelievable view. From the main entrance you can immediately enjoy a very large living area with fireplace, kitchen and laundry and storage of about 25 sqm. From the living room you can access directly to a wonderful porch of about 10 sqm where you can stay, dine or just relax in front of an excellent view of the surrounding vineyards. On the first floor there are three bedrooms, a bathroom. two storages and hallway leads to a large panoramic terrace of about 25 sqm. The property has approximately 2000 sqm of garden surrounding the house with 12 olive trees and enough flat area for the construction of a swimming pool. 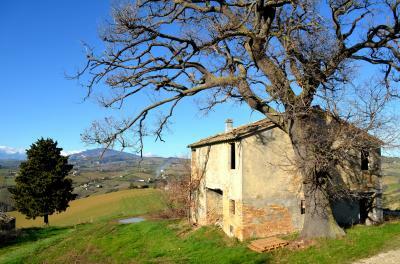 Excellent solution for who want to live in Marche Region immersed in the Nature at short distance from the Adriatic Sea.